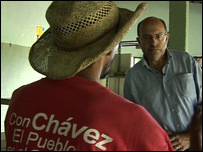 This World's John Sweeney goes to Venezuela to investigate just how good the controversial President is at running his own country. President Hugo Chavez calls the United States "Dracula" and George W. Bush "Mr Danger", "a drunk" and "a donkey". He can get away with being rude to the most powerful man on earth and challenging the economic might of the United States because his country sits on trillions of dollars worth of oil. He may well be considered the luckiest left-wing leader, ever. Five years ago he was the victim of a right-wing coup which could have resulted in his death, but the people rose up in his defence and a stronger, tougher Chavez emerged. 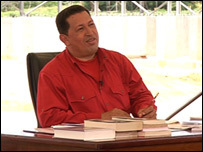 As well as a huge bank of oil, Chavez has great political nous, a common touch and he's won three elections in a row. Now he wants a new constitution. But although the poor of Venezuela love the man who was born in a mud hut, his right-wing critics condemn him as a crazy dictator and point to international research that places Chavez's country as one of the most corrupt on earth. In The Trillion Dollar Revolutionary John Sweeney asks, just how good is Hugo Chavez at running his own country?